This is an image of room sized wireframes of platonic solids which Anne Tyng made for a show at the ICA in Philadelphia. 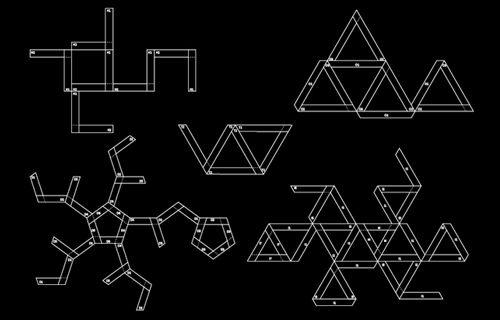 An initial observation is that the wireframes are made from sheet-material instead of sticks, as one would typically do. In addition, not every ribbon is made twice, as one would expect (to make the solids perfectly symmetrical), but just once. 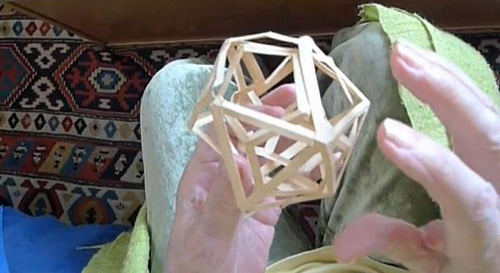 The more obvious, expected solution is demonstrated in Image 2, where Anne, at age 91, holds an icosahedron that contains a dodecahedron, while sitting on the edge of her bed in Greenbrae. The center part of each plane is cut out and the edges of every plane form the ribbons (two times). But the approach Anne chose to make the solids for the exhibition is more interesting. In terms of form, plastically, the platonic solid is no longer symmetrical; one has to choose which edges to keep and how to combine them. And it is more economical; not every ribbon is made out of two plane edges but just one. The next few animated GIFs demonstrate how the solids were put together for the show. Sometime after making the animated GIFs (whoever still makes animated GIFs anno 2013?) for the octahedron, the cube and the tetrahedron by looking at images of the models and trying to figure out how it was done, I came across this preparation drawing by Kristen Smith and Srdjan Weiss (Normal Architecture Office) for the show. TO DO: Make an animated GIF showing the formation of one platonic solid, holding an other one.